KawaiiPunk - Kawaii Mascot Blog: MaShusik! Funky Punks! A lot of people seem to think cute and punk don’t mix. Obviously these people have never met me :) Someone else these people have clearly never met is the designer I want to introduce you all to today. And they’ve proved beyond a shadow of a doubt that cute and punk not only mix, but get along like a house on fire! 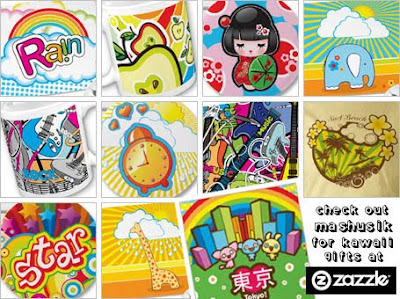 This folks is just a sample of what is available at the fantastic MaShusik Zazzle store. And, as you can see by these Funky Punky designs, we now have undisputable proof that the worlds of cute and punk can exist in perfect harmony! Not only that, we also have proof that MaShusik is one of the coolest places to shop all your kawaii gifts! Enjoy!